I thought I should do a page on off the beaten track places in Scotland. Then I realised that what I consider to be off the beaten track might not be the same as your view. I mean, where I live in Scotland is, to me, pretty much the centre of the known universe, but to you might be the middle of nowhere. You see, it all comes down to perspective. On one hand, most of Scotland could be considered off the beaten track - except for those heavily promoted areas - for example, Edinburgh, St Andrews, Inverness and Loch Ness, and the Isle of Skye. On the other hand, Scotland isn’t a big nation geographically, so the word ‘undiscovered’ doesn’t apply in any remotely literal sense. It isn’t as if you are going to find a lost clan living up the glen somewhere and existing by stealing cattle and eating tourists. Even most off the beaten track places are - relatively speaking - quite close to a Walmart store. I can’t emphasise enough how it’s a relative term. Is, say, Ullapool off the beaten track? It’s also a very slippery concept. There are chunks of the country that have the air of places that are off the beaten track, for example, Torridon and Applecross, Ullapool and Lochinver, or just about anywhere on the north-western seaboard - but are really quite well-known and on a kind of ‘milk-run’ for the slightly adventurous. Especially as initiatives such as the ‘North Coast 500’ have directed visitors onto the sometimes less than adequate roads of the North of Scotland in ever greater numbers. So maybe the sort of places that might interest you, if you are looking for somewhere in Scotland that isn’t too over-run in the main season, might be those parts of the country that have pleasant scenery, a sense of community and lots of points of interest. Importantly, these would probably be locations that haven’t been flogged to death by travel writers spuriously implying they are newly discovered, eg the Fairy Pools on Skye or Sandwood Bay on the north-west seaboard. The first area that comes to mind is the Angus Glens. Now, plenty of visitors go up the main A9 corridor - Perth - Dunkeld - Dalwhinnie - Aviemore and so on. Some more adventurous souls go over the high A93 between Perth and Braemar and into Royal Deeside. The main A90, further east still, is certainly a busy route (to Aberdeen and beyond) but fewer visitors, I reckon, stop off to explore the old county of Angus, through which the dual-carriageway road rushes. This is a pity. Exploring the Angus Glens is a real insight into the Grampian ‘massif’ - the uplands in the south-eastern edge of the Cairngorms National Park. The main glens all have public roads running surprisingly far into them. It’s 18 miles 29 km, for instance, from the town of Kirriemuir to the carpark at the head of Glen Clova. You may have sat-nav. Alternatively, this is where you might want to treat yourself to a real paper road atlas. The best road atlas for Scotland is on that Amazon link. (By the way, if you know where to look, one of the rarest plants in the British Isles grows up in the crags hereabouts.) Glen Esk, with the town of Edzell as its gateway, is also interesting. All of the Angus Glens are ancient through-routes (though except for Glen Shee not with motor vehicles) to the lands of the north, and have a real sense of history. A really nice place to stay is Glen Clova Hotel and Lodges - peaceful, serves local produce and dog-friendly! Another place we really like is Tigh-na-Leigh Guest House in the small town of Alyth - it is only 20 minutes drive west of Kirriemuir. This place is big on hospitality, great food and it’s friendly, cosy and dog-friendly too! Galloway on the map of Scotland. At the other end of Scotland, Galloway is another area that I think of as off the beaten track. Unlike Angus, somewhere you pass through on the way to somewhere else, you have to commit to going to Galloway. In short, coming from ‘down south’ you have to turn west when you cross the Border. And most people don’t. Galloway is a charming and rural area with dark skies as well as a former bobbin mill in the wee town of Gatehouse of Fleet to visit among many other features. And I’ve been there a few times now and I am none the wiser what a bobbin is. We hear great things of The Ship Inn if you want to enjoy a short break here. And when you are in the area, you can swing north to take in the excellent Robert Burns Museum over the ‘county’ border in Ayrshire. The countryside, especially the coast east of Inverness, by way of Moray and Aberdeenshire, can be quiet enough so that visitors are allocated a beach each on an individual basis. My friend here was lucky to get a last-minute cancellation, though he did find the big stones a bit uncomfortable. Anyway, what’s that you say? You did the Northern Highlands last year? And it rained? Well, seriously, you could go east. Charlie Chaplin used to enjoy playing golf at Nairn, there’s a posh cashmere mill in Elgin, there are picturesquely painted fishermen’s houses at Findochty and Cullen and there are dolphins and ospreys fishing, whisky distilleries and castles and...very few midges. Plus there are lots of lovely places to stay in Moray too. Did I manage Moray in a nutshell? No? Well, I've also got a page that explains why the sun shines in Moray. The cliffs of the outer Moray Firth, between Banff and Fraserburgh. I won’t say exactly where, because it’s off the beaten track. But if you stray further east, say 70+ miles (112+km) east of Inverness, then the countryside starts to look more bare, though well-farmed, and the coastline gets more spectacular on the bleak shoulders of Buchan. It's beginning to get near a working definition of what many visitors would find remote, though there is a Tesco in both Banff and Fraserburgh - so don't worry. You could say that was off the beaten track. Go to Troup Head for a gannet colony in summer - or explore the tiny village of Crovie and the caves at New Aberdour beach (now that really is off the beaten track). Or at least it was until they made part of the 2017 movie Whisky Galore there. Then, even further east, there is the Loch of Strathbeg for bird watching - go in winter for spectacular flighting grey geese. We have always liked The County Hotel in Banff - especially for the food - the French owner/chef Eric has a very good reputation. Other places we like are Meldrum House Hotel at Oldmeldrum and Saplinbrae Hotel and Lodges at Mintlaw. If all those crashing waves and soaring cliffs sounds a bit too easterly and austere and not like your heathery preconception of Scotland, then I’ll have to think of somewhere in the west for you. Somewhere that qualifies as off the beaten track because it takes a bit of effort to get there. Right, Ardnamurchan fits that description. All my memories of the Ardnamurchan peninsula recall winding roads west of Salen with blind bends set in delectable oakwoods and rhododendron thickets (though I may be exaggerating slightly about the rhododendrons). Personally, I’d take the ferry from Tobermory on the Isle of Mull to Kilchoan on the peninsula to discover the Ardnamurchan area. That way I’d have a couple of days to eat my way along the seafoody Tobermory waterfront. For that matter, is Mull off the beaten track too? Kind of...but you could say that of every Scottish island except Skye. What’s almost off the beaten track in Scotland? One of Scotland’s odder places (as well as qualifying in the off the beaten track criteria) Kinlochleven owes its origins to aluminium smelting, of all things. There was a smelter here, using hydro-electric power from reservoirs further into the hills. Uhmm, Campbeltown at the end of the Kintyre peninsula. Cromarty at the end of the Black Isle (possibly). Even Dornoch, a bit further north, has that out of the way feel to it - and it’s a charming wee place with a superb golf course - sometimes called ‘the St Andrews of the North’. And you could just about argue that places bypassed by the A1, like Eyemouth or St Abbs, are slightly off the beaten track too. 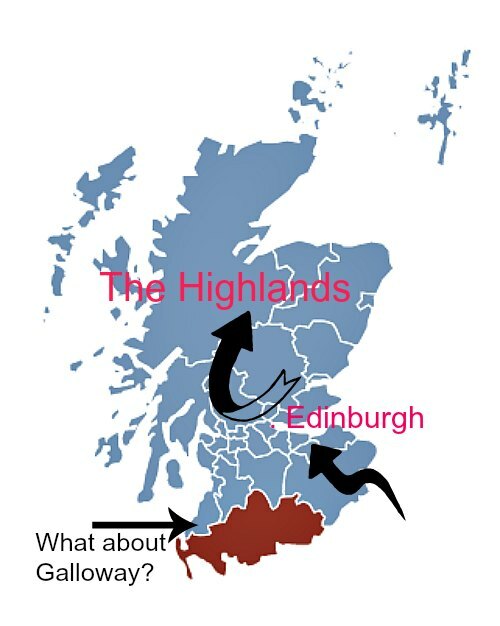 Wait though, what about Kinlochleven, hemmed in by hills with a road that goes in one side of the place and comes out again in the opposite direction, only on the other side of the loch? There’s an example of a place you have to want to go. So, what about places at extremes? Fraserburgh or Thurso or Knoydart or the Mull of Galloway? I suppose they are off the beaten track. Or places that almost seem to cultivate an out of the way ethos? Applecross is the best example. A remote setting but - like Plockton - it has had its moment of fame on television and hence attracted attention. Maybe off the beaten track is a label you can lose when the beaten track suddenly arrives at your door. I mean, have you tried booking into the local hotel in Wester Ross in the last year or two? So, in conclusion, I reckon everyone will have their own definition of what is off the beaten track in Scotland. There are still empty beaches and also a few peaks that require an overnight camp to climb them - perhaps the nearest we’ve got to truly ‘remote’. Otherwise, be thankful there’s still room for everyone and that we can enjoy the illusion of remoteness. Scotland is good at that. The Ardnamurchan peninsula feels more like an island, way out west on Scotland’s seaboard. Rugged with a remote air, it’s quite a Highland adventure.